TVS Motor Company has played a prominent role in mobilizing this nation. The TVS XL moped made the concept of private transportation a reality to countless rural customers. Women got their two-wheeled freedom with the TVS Scooty, and its popularity reached such heights that it became a household name for a scooter. With TVS Racing, the brand also has a rich history in Motorsports. Coming back to the scooter market, the brand already has the Wego and the Jupiter to appeal buyers who want a conservative but practical premium scooter. 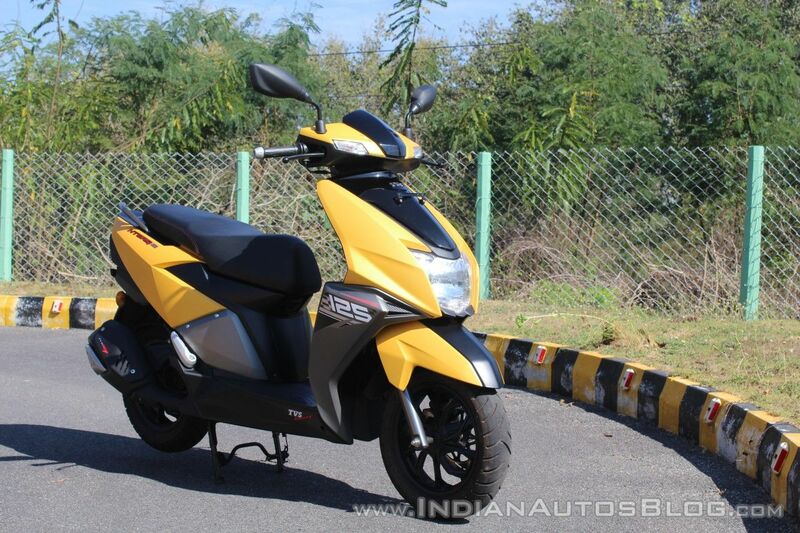 With the advent of the Aprilia SR 150, and Honda Grazia, manufacturers are realising how important is the need for a trendy looking, youth-centric scooter. 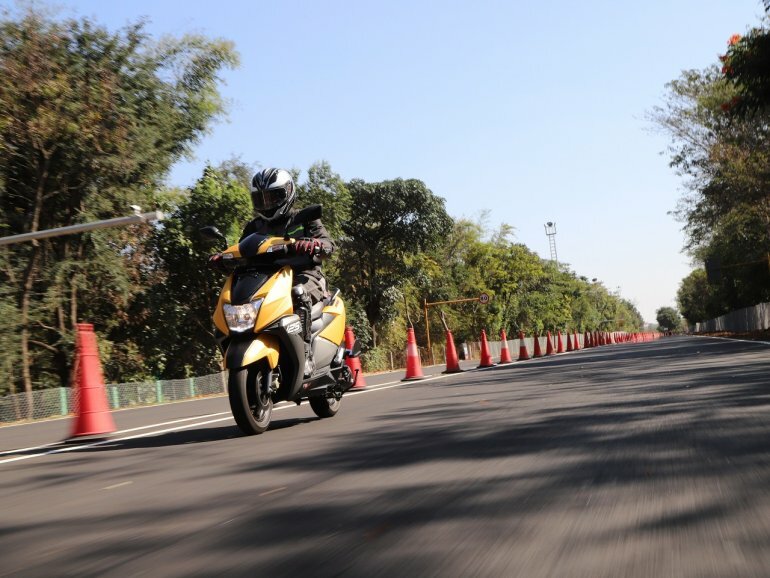 TVS, with its experience in the scooter market coupled with its racing expertise, brought the Graphite Concept to the 2014 Auto Expo in India. The scooter had a revolutionary AMT gearbox with paddle shifters. It also used an LED instrument console to display ride data, vehicle information and connectivity. Four years later, the company has now given us the production version of the concept, the TVS Ntorq 125. With its never-before-heard features, the Ntorq is an effervescencent addition to the burgeoning 125 cc scooter segment. The TVS Ntorq has taut bodywork with angular design elements on the apron sides and on the body panels below the seat. The apron mounted headlight is a HS1 halogen unit, with an LED DRL below. Thanks to the DRL, the main headlamp need not stay on all the time. The nicely designed rear view mirrors are functional too. The handlebar cowl sports the ‘SmartXonnect’ sticker, hinting at its multifunctional connectivity feature. The front indicators are on the handlebar cowl and the rear comes with an LED tail light. The two fighter-jet-like faux vents really spice up the already interesting-looking T-shaped tail light. TVS has also spent time in designing the matte black exhaust so that it looks as interesting as the rest of the scooter. The brushed metal shroud near the exhaust outlet adds contrast as well. The seat comes with premium red stitching, and has a small mound demarcating the rider and the passenger area. 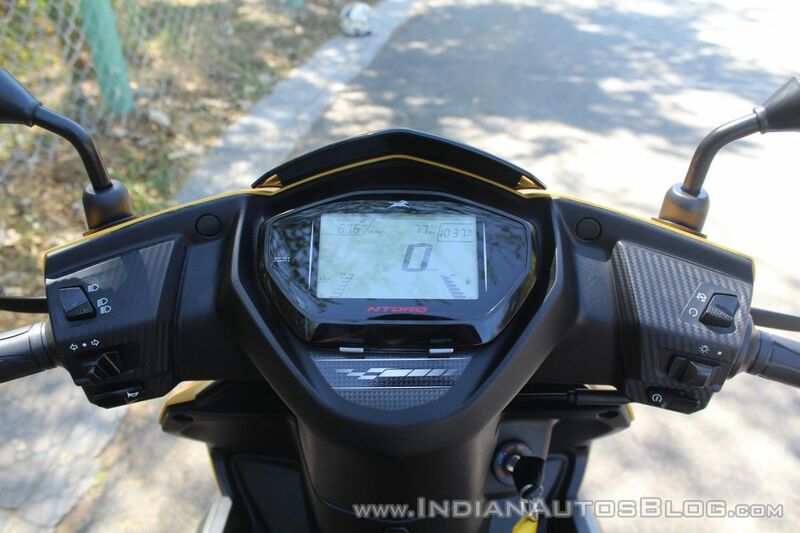 The split grab-rails look very Apache-like, and located just behind the pillion seat is the fuel filler cap. The riding position is comfortable enough for an average-sized rider. While overall, the bodywork looks very well-made, the faux carbon fibre panel below the floorboard does feel a tad flimsy. 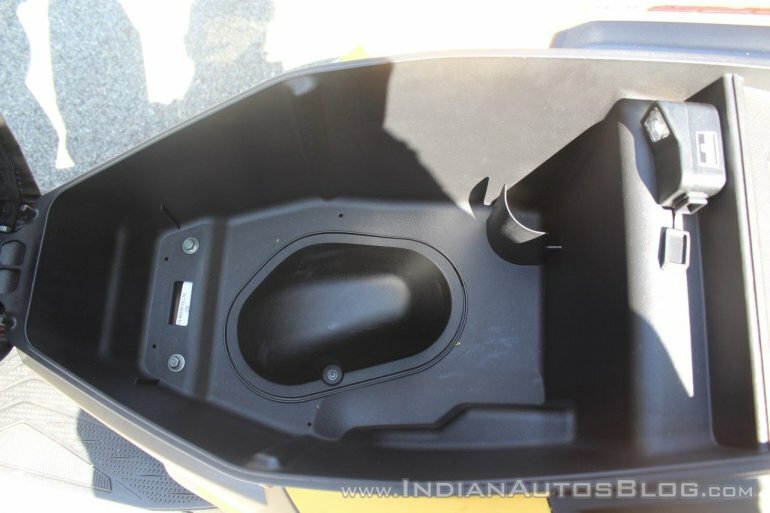 The TVS Ntorq 125 comes with a retractable hook on the apron, and there’s one below the seat as well. There is no fuel cap / seat release button on the apron, so one has to operate them by slotting in the key on the side panel. The switchgear quality is top-notch, and the Ntorq comes with an engine-kill switch as well, which is a first for a scooter. The pass-beam switch is integrated into the high-low beam toggle switch; and the rear brake gets an easy-to-operate parking brake lever. The under-seat storage has a 22-litre capacity. It can effortlessly gobble up a full-face helmet and then some. There is an LED light for the storage and a USB slot to charge electronic devices. The VIN is located next to the storage space. 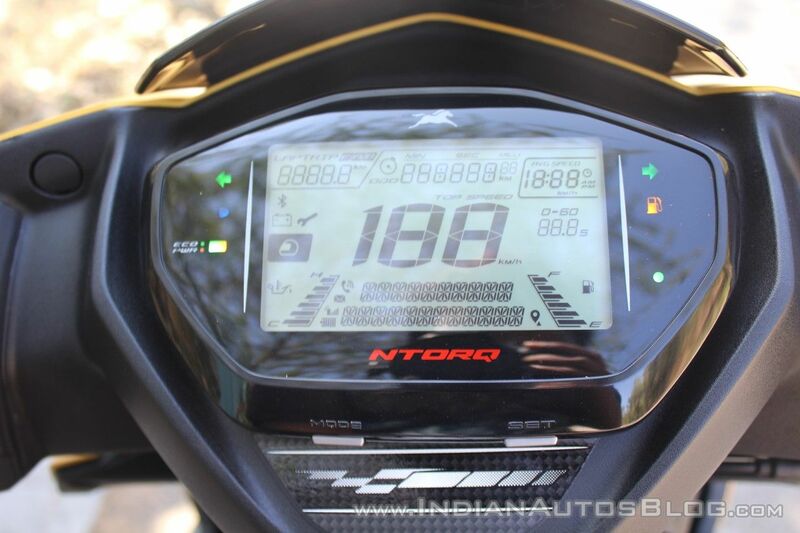 The TVS Ntorq 125 comes with a fully digital instrument cluster with SmartXonnect technology. The instrument cluster can be paired with a smart phone using the Ntorq app. The app is available on Google Play Store, and will be released on IOS platform soon. The right side of the instrument cluster houses the notification light (which lights up when receiving calls, SMS, etc); low fuel light, right indicator. On the left side, there is high-beam, left indicator and an Eco/Power indicator. When ridden with a sensitive throttle, this indicator turns green, and it turns yellow if ridden aggressively. On connecting the phone with the scooter, one can customise the welcome note with one’s name. When there’s a phone call, it displays the caller’s name (if stored in the phone), otherwise, it shows the caller’s number. Same goes for SMS as well. The 'Do not disturb' mode and 'Auto reply SMS' help in conveying the caller that the user is riding. There’s an overspeed alert which alerts the rider if the set speed is crossed. It does not restrict the speed, however. TVS has collaborated with Map My India for navigation. Using the app, one can set the destination, and while riding, the scooter’s cluster displays the turn-by-turn navigation with distance. This feature eliminates the need to pull over and consult the phone for directions. 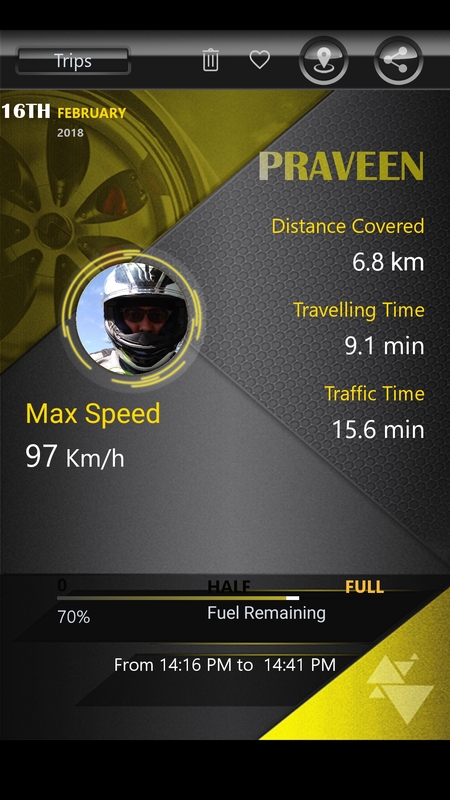 The app also generates a ride report at the end of a trip, recording the distance covered, top speed, travelling time and traffic time. The Last Parked Location Assist is handy in spotting the scooter in a big parking lot. The cluster has two ride-statistic modes- Street and Sport. In the former, one can find trip meter, time, odometer readings. The Sport mode displays the lap distance, lap time,0-60 kmph reading, top speed record, and average speed. In both the modes, the speedometer, fuel gauge and the oil temperature gauge are common. Apart from trip meter A and B, there is a trip F, which starts measuring the distance covered as soon as the fuel level hits reserve. Speaking of fuel, the tank has a 5 L volume including reserve. Apart from the aforementioned features, there is also a low-battery indicator, service reminder and a helmet reminder. 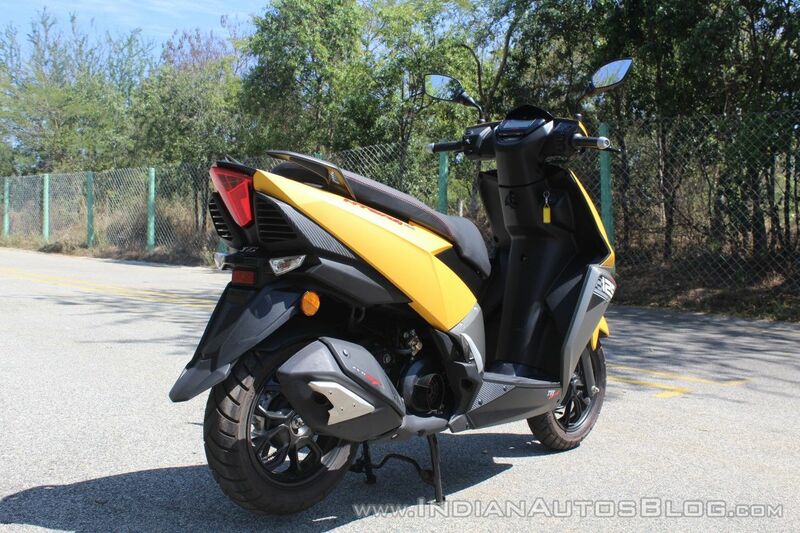 The TVS Ntorq has a 124.79 cc three-valve OHC heart with air cooling. The CVTi-Revv engine is peppy, and offers brisk acceleration right up to 85 kmph. 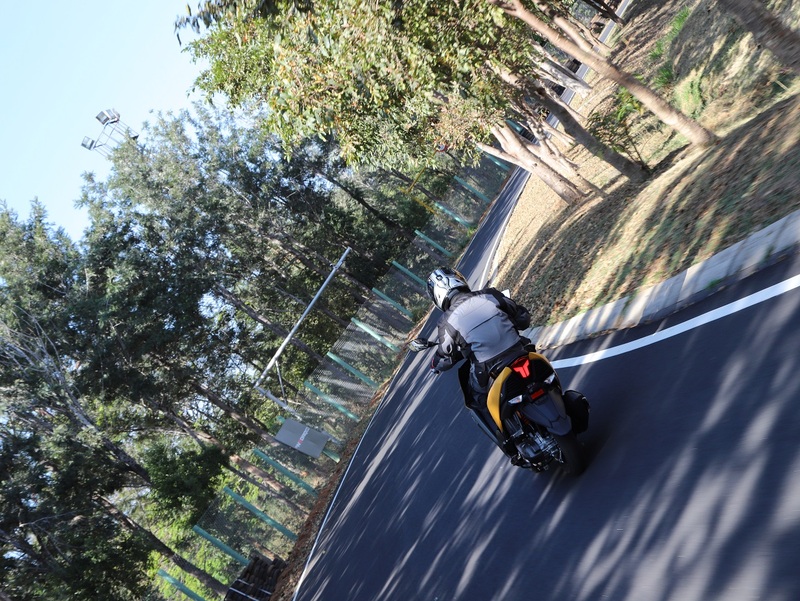 I was able to hit a top speed of 97 kmph in the short test track we rode on. Though the top speed is a claimed 95 kmph. 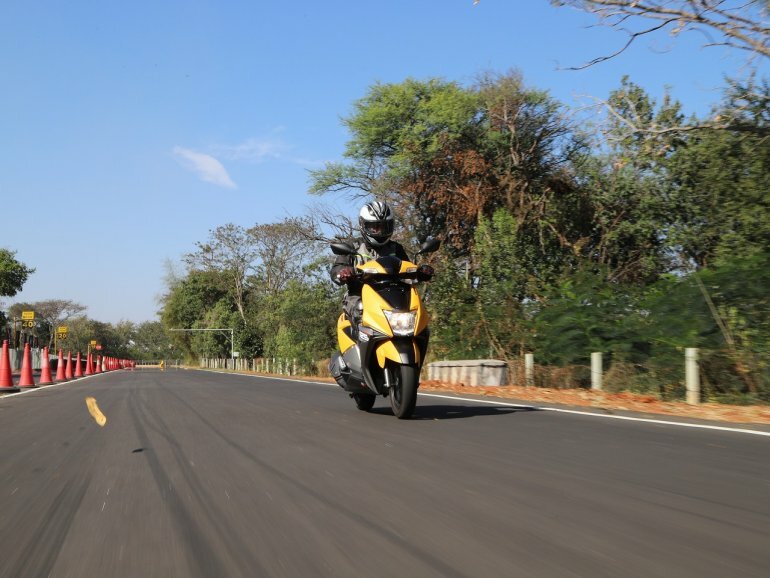 The scooter can sustain speeds of up to 90 kmph without stressing too much. 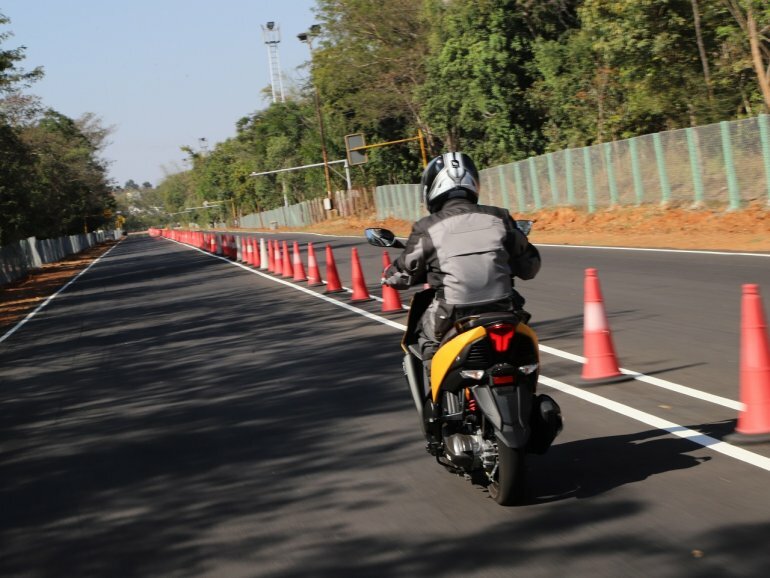 The performance is adequate for a 125 and safe to say, it does feel like a sporty scooter complemented well by the grunt from the sporty stub muffler. The peak power of 9.4 PS comes in at 7,000 rpm, and the maximum torque of 10.5 Nm arrives at 5,500 rpm. The torque-biased performance is evident in the scooter’s acceleration. The only thing that’s missing is a tachometer. What surprised me more than its performance is the engine’s refinement. There are no intrusive vibrations at any speeds. Kudos to TVS for keeping the engine butter-smooth. Those looking for Japanese-level refinement can sure give the Ntorq a look. Coming to the efficiency department, the scooter gives 48 km to the litre, as per ARAI standards. I was able to ride up to 62 kmph in the Eco mode, post which the indicator turns yellow (power mode). The TVS Ntorq rides on telescopic front fork, and twin-tube gas-charged rear monoshock. The damping is nicely tuned for both comfort and performance. The scooter handled the obstacle course without giving me any reason to complain thanks to the 73 mm travel up front and 93 mm travel at the rear, and a ground clearance of 155 mm. The 100-section front and the 110-section tubeless tyres offer excellent grip, and instill confidence while cornering as well. The scooter retains its composure at high speeds too. Pull the brake levers, and you can feel the calliper biting the 220 mm front petal disc hard, shedding speed with swift grace. The rear 130 mm drum also has impressive bite and feel, and the combination of the front and rear gives the Ntorq rider a very reassuring sense of control while doing high speeds. The diamond-cut alloy wheels are 12-inch units on both front and rear. All this comes at a mouth-wateringly brilliant price of INR 58,750, ex-showroom, Delhi. The TVS Ntorq 125 rivals Honda Grazia, Vespa SXL / VXL 125, Suzuki Access 125, and the newly launched Aprilia SR 125. The scooter comes in four colours: Matte Yellow, Matte Green, Matte Red and Matte White. 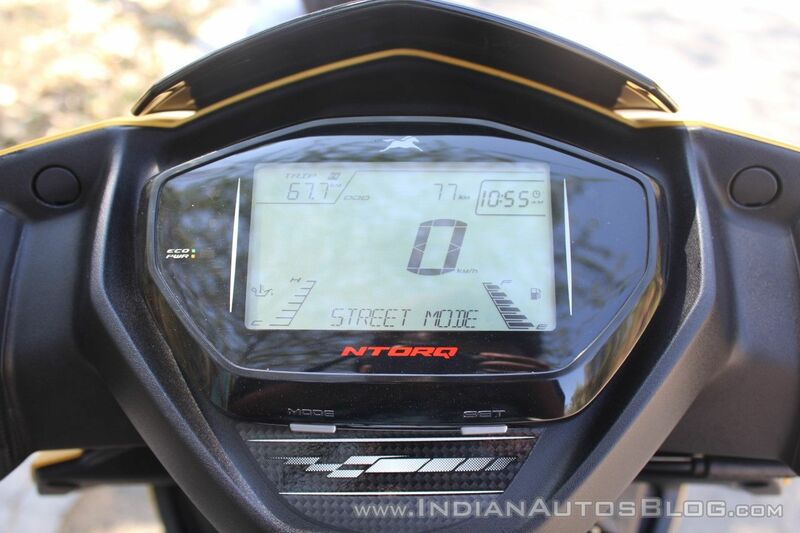 The TVS Ntorq 125 is a perfect example of a manufacturer taking the initiative of offering something unique and in with the times rather than applying the same tired and tested formula. Its segment-first features like the SmartXonnect are not only novel, but also highly practical. TVS aims entice the Gen Z youth with its new scooter. The SmartXonnect is indeed a stepping stone for future two-wheeler vehicle connectivity and kudos to TVS for making an effort and executing it rather well.